How you feel, emotionally, during pregnancy could influence your child's eating habits. And conditions like postpartum depression could play a part. According to a recent study, moms who experience anxiety or depression during pregnancy might have children who are fussier eaters. This link could exist between both mother and child and father and child, as the correlation doesn't just take hold during pregnancy, but also in the years before a child starts school. According to the study, moms can pass this trait to their children during pregnancy and the first few years of life, while fathers can influence a child's eating habits after birth. In the context of this study, fussy eaters are defined as those who reject certain types of food. If you're already a parent, we probably don't have to tell you that this is pretty common in children—or that it's incredibly stressful for parents—but did you know that picky eaters are at risk for more serious problems? Constipation, weight problems and behavioral issues can all spring from bad eating habits. The researchers analyzed 4,746 mothers and 4,144 fathers who had babies between 2002 and 2006 to come to this conclusion. The parents completed questionnaires during pregnancy and then again three years later, reporting their own symptoms of anxiety and depression as well as information about their children's eating habits. 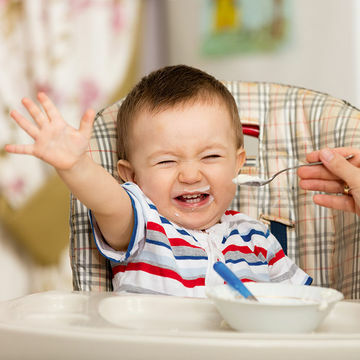 By age three, about 30 percent of the children were classified as fussy eaters. The researchers looked at other factors, like educational attainment and household income. Each additional point moms scored on a scale that measured anxiety was associated with an extra point on the scale measuring picky eating habits. Researchers observed a similar correlation between fussy eating and maternal depression: Women who experienced more depression before and after birth had children who scored higher on the fussy eating scale as well. Because this was an observational study, it's not possible to draw any firm conclusions about the link between these factors, but the researchers believe there's something to this. "[The research] strongly suggests that the direction of the associations with mothers' antenatal symptoms is from mother to child," the researchers wrote in the study's release. "Clinicians should be aware that not only severe anxiety and depression, but also milder forms of internalizing problems can affect child eating behavior."